I know that y'all have been waiting for pictures of the cruise and the wedding so I am now blogging them. This is us in line to get on the ship. 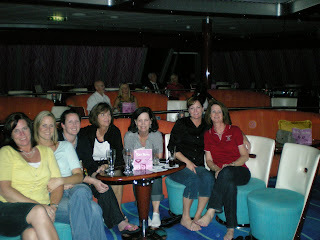 If you go to Tara's, Lisa's blog you will see more pictures of us on the cruise. So I will just put on a few that they do not have. 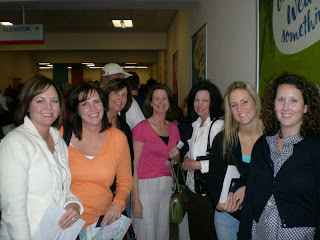 The line was long and Jo was so dizzy due to an ear infection that she could hardly stand. We all are so happy to be this close to getting on the ship. 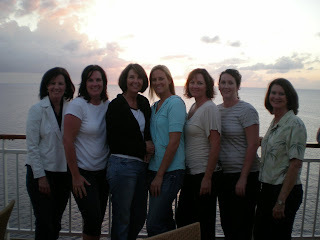 We had so much fun I think that we should do a trip so that every girl in the family can go. Maybe to New York City or Vegas. This is one of the restaurants on the ship. We had alot of fun trying out all of the places to get food. It was an Italian place. Not our favorite although. We loved to dance each night we went to a night club and danced the night away. This night was 50's and 60's . Each of us had our moves on the floor. At some ports of call you dock and others you have to take a ferry boat. 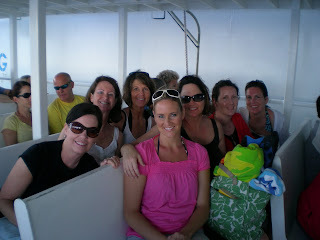 This is us ready for a fun day at the beach on the ferry to Grand Cayman. The day was beautiful and hot. We are all looking great. A little red from the day before in Mexico. 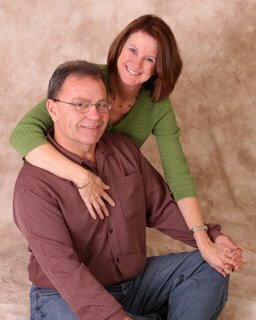 Check out the line up on Tara's blog. The last evening on the ship the sunset was so nice that we have a picture taken on the back of the boat. 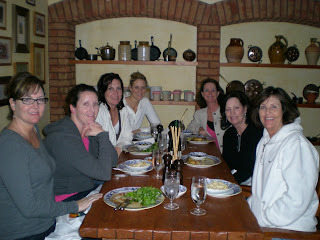 I really had a great time with all who went and look forward to having another "Girl's Trip" when more of the girls can come. Why does it seem so long ago? I wish we were still getting ready for the trip. Love you!